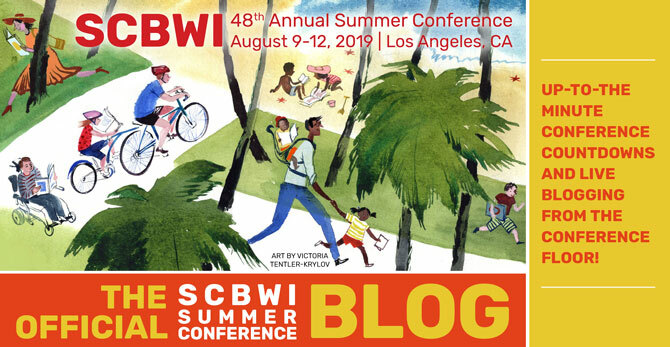 The Official SCBWI Conference Blog: The SCBWI Gay (GLBTQ) Mixer Pulls In A Crowd! 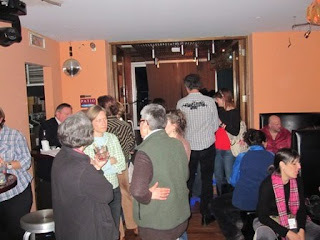 25 of us - published, pre-published, and supporters, gathered at Uncle Charley's Bar to talk with Simon And Schuster Art Director Laurent Linn, Scholastic Associate Editor Jody Corbett, and T.S. Ferguson (a former editor at Little Brown) to mix and mingle and meet as a sort of professional Gay-Straight Alliance of the kid lit world. 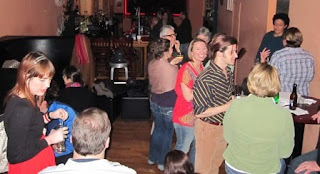 After a round of introductions and some schmoozing, we got our drinks, settled down in a big circle, and took over the bar! We spoke about the distinction between writing books that were all about a character's being Queer (Gay, Lesbian, Bisexual, Transgender, and/or Questioning) and books where GLBTQ characters were just part of the fabric of the world of the story - just as GLBTQ teens are part of the fabric of our real world. And many questions about "Is this kind of book out there?" We discussed the recent whitewashing controversy (where publishers put white representations of the main character on the cover of books where the character is a person of color) and how the voices raised outside the specific disenfranchised group can help effect change. We spoke of allies and success stories, upcoming releases, and the emotional truth that all characters need to have - gay or straight! It was a lively discussion of passionate people, and talk of future sessions on craft had the room pumped up and excited for the future.